Last night we celebrated the birthday of one of my dearest friends. That's when I discovered I didn't have very many birthday cards in my stash. So I decided to fix that. 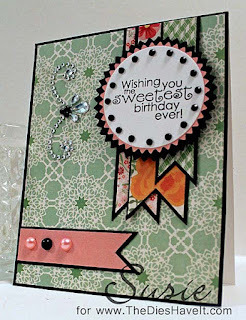 Here is one I did using a digital stamp from Sweet 'n Sassy Stamps. 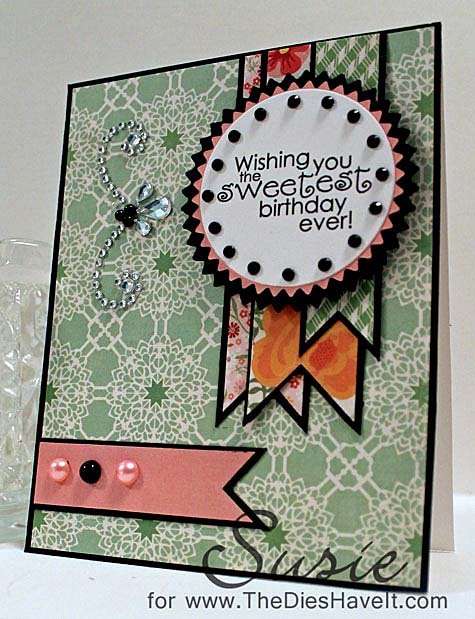 After printing the sentiment, I cut it out with a Spellbinders circle die and then used two Spellbinders pinking dies for the double mats. Of course there is chipboard underneath to give it some dimension. The paper are all from Echo Park's For the Record 2 (by Lori Whitlock) and the gems are from my stash. I based my card on this sketch from The Sweet Spot. I can see myself using this one again and again. LOTS of possibilities. But at least for now I have another birthday card to send out. So that's it for today. I'll be right back here tomorrow with another Freebie Friday for you. Oh, how pretty Susie. Love the pretty papers and the blings. Thank you for playing along with us at The Sweet Stop. Love this!! Fantastic way to feature this sentiment! Cute card - I love this sketch!